Rajiv Ratna Gandhi ( 20 August 1944  21 May 1991) was the 6th Prime Minister of India , serving from 1984 to 1989. He took office after the 1984 assassination of his mother, Prime Minister Indira Gandhi, to become the youngest Indian Prime Minister at the age of 40. Gandhi was a scion of the politically powerful NehruGandhi family, which had been associated with the Indian National Congress party. For much of his childhood, his maternal grandfather Jawaharlal Nehru was Prime Minister. Gandhi attended college in the United Kingdom. He returned to India in 1966 and became a professional pilot for the state-owned Indian Airlines. In 1968 he married Sonia Gandhi; the couple settled in Delhi to a domestic life with their children Rahul Gandhi and Priyanka Gandhi Vadra. For much of the 1970s, his mother Indira Gandhi was prime minister and his brother Sanjay Gandhi (earlier Sanjay) an MP; despite this, Rajiv Gandhi remained apolitical. After Sanjay’s death in an aeroplane crash in 1980, Gandhi reluctantly entered politics at the behest of Indira. The following year he won his brother’s Parliamentary seat of Amethi and became a member of the Lok Sabhathe lower house of India’s Parliament. 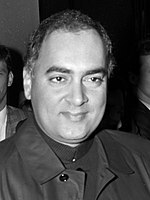 As part of his political grooming, Rajiv was made a general secretary of the Congress party and given significant responsibility in organising the 1982 Asian Games. On the morning of 31 October 1984, his mother was assassinated by two of her bodyguards; later that day, Gandhi was appointed Prime Minister. His leadership was tested over the next few days as organised mobs rioted against the Sikh community, resulting in riots in Delhi. That December, an almost nationwide sympathy vote for the Congress party helped it win the largest Lok Sabha majority to date, 411 seats out of 542. Rajiv Gandhi’s period in office was mired in controversies; perhaps the greatest crises were the Bhopal disaster and the Shah Bano case. In 1988 he reversed the coup in Maldives, antagonising militant Tamil groups such as PLOTE, intervening and then sending peacekeeping troops to Sri Lanka in 1987, leading to open conflict with the Liberation Tigers of Tamil Eelam (LTTE). In mid-1987 the Bofors scandal damaged his corruption-free image and resulted in a major defeat for his party in the 1989 election. Gandhi remained Congress President until the elections in 1991. While campaigning for the elections, he was assassinated by a suicide bomber from the LTTE. His widow Sonia became the president of the Congress party in 1998 and led the party to victory in the 2004 and 2009 parliamentary elections. His son Rahul is a Member of Parliament and Vice President of the Congress. In 1991 the Indian government posthumously awarded Gandhi the Bharat Ratna, the country’s highest civilian award. At the India Leadership Conclave in 2009, the Revolutionary Leader of Modern India award was conferred posthumously on Gandhi. Rajiv Gandhi seen here with his son Rahul in 1984. Rajiv Gandhi was born in Bombay on 20 August 1944 to Indira and Feroze Gandhi. In 1951, Rajiv and Sanjay were admitted to Shiv Niketan school, where the teachers said Rajiv was shy and introverted, and “greatly enjoyed painting and drawing”. He was admitted to the Welham Boys’ School and Doon School in 1954, where Sanjay joined him two years later. Rajiv was sent to London in 1961 to study A-levels. From 1962 to 1965 he studied engineering at Trinity College, Cambridge, but did not obtain a degree. In 1966 he began a course in mechanical engineering at Imperial College London, but did not complete it. Gandhi really was not interested in mugging for his exams, as he went on to admit later. Gandhi returned to India in 1966, the year his mother became Prime Minister. He went to Delhi and became a member of the Flying Club, where he was trained as a pilot. In 1970, he was employed as a pilot by Air India; unlike Sanjay, he did not exhibit any interest of joining politics. In 1968, after three years of courtship, he married Edvige Antonia Albina Màino, who changed her name to Sonia Gandhi and made India her home. Their first child, a son, Rahul Gandhi was born in 1970. In 1972, the couple had a daughter, Priyanka Gandhi, who married Robert Vadra. Gandhi’s younger brother Sanjay died in an aeroplane crash on 23 June 1980. At that time, Rajiv Gandhi was in London as part of his foreign tour. Hearing the news, he returned to Delhi and cremated Sanjay’s body. In the week following Sanjay’s death, Shankaracharya Swami Shri Swaroopanand, a saint from Badrinath, visited the family’s house to offer his condolences. He advised Rajiv not to fly aeroplanes and instead “dedicate himself to the service of the nation”. 70 members of the Congress party signed a proposal and went to Indira, urging Rajiv to enter politics. Indira told them it was Rajiv’s decision whether to enter politics. When he was questioned about it, he replied, “If my mother gets help from it, then I will enter politics”. Rajiv entered politics on 16 February 1981, when he addressed a national farmers’ rally in Delhi. During this time, he was still an employee of Air India. On 4 May, Indira Gandhi presided over a meeting of the All India Congress Committee. Vasantdada Patil proposed Rajiv as a candidate for the Amethi constituency, which was accepted by all members at the meeting. A week later, the party officially announced his candidacy for the constituency. He then paid the party membership fees of the party and flew to Sultanpur to file his nomination papers and complete other formalities. He won the seat, defeating Lok Dal candidate Sharad Yadav by a margin of 237,000 votes. He took his oath on 17 August as Member of Parliament. Rajiv Gandhi’s first political tour was to England, where he attended the wedding ceremony of Prince Charles and Lady Diana Spencer on 29 July 1981. In December the same year, he was put in charge of the Indian Youth Congress. He first showed his organisational ability by “working round the clock” on the 1982 Asian Games. He was one of 33 members of the Indian parliament who were part of the Games’ organising committee; sports historian Boria Majumdar writes that being “son of the prime minister he had a moral and unofficial authority” over the others. The report submitted by the Asian Games committee mentions Gandhi’s “drive, zeal and initiative” for the “outstanding success” of the games. Meeting Russian Hare Krishna devotees in 1989. On 31 October 1984, the Prime Minister, Gandhi’s mother Indira Gandhi, was assassinated by her Sikh bodyguards, which led to violent riots against Sikhs. At a Boat Club rally 19 days after the assassination, Gandhi said, “Some riots took place in the country following the murder of Indiraji. We know the people were very angry and for a few days it seemed that India had been shaken. But, when a mighty tree falls, it is only natural that the earth around it does shake a little”. According to Verinder Grover, the statement made by Gandhi was a “virtual justification” of the riots. Congress leader Mani Shankar Aiyar wrote, “Did it constitute an incitement to mass murder?” He also criticised Gandhi for his reluctance to bring the army from Meerut to handle the mob. Rajiv Gandhi was in West Bengal on 31 October 1984 when his mother, Prime Minister Indira Gandhi, was assassinated by two of her Sikh bodyguards, Satwant Singh and Beant Singh, to avenge the military attack on the Golden Temple during Operation Blue Star. Sardar Buta Singh and President Zail Singh pressed Rajiv to succeed his mother as Prime Minister within hours of her murder. Commenting on the anti-Sikh riots in Delhi, Rajiv Gandhi said, “When a giant tree falls, the earth below shakes”; a statement for which he was widely criticised. Many Congress politicians were accused of orchestrating the violence. Soon after assuming office, Gandhi asked President Singh to dissolve Parliament and hold fresh elections, as the Lok Sabha had completed its five-year term. Gandhi officially became the President of the Congress party, which won a landslide victory with the largest majority in history of the Indian Parliament, giving Gandhi absolute control of government. He benefited from his youth and a general perception of being free of a background in corrupt politics. Gandhi took his oath on 31 December 1984; at 40, he was the youngest Prime Minister of India. Historian Meena Agarwal writes that even after taking the Prime Ministerial oath, he was a relatively unknown figure, “novice in politics” as he assumed the post after being an MP for three years. After his swearing-in as Prime Minister, Gandhi appointed his fourteen-member cabinet. He said he would monitor their performance and would “fire ministers who do not come to the mark”. From the Third Indira Gandhi ministry, he removed two powerful figures; Finance Minister Pranab Mukherjee and Railway Minister A. B. A. Ghani Khan Choudhury. Mohsina Kidwai became the Minister of Railways; she was the only female figure in the cabinet. Former Home Minister PV Narasimha Rao was put in charge of defence.V.P. Singh who was initially appointed as the Finance Minister, was given the Defence Ministry in 1987. During his tenure as Prime Minister, Gandhi frequently shuffled his cabinet ministers, drawing criticism from newspaper India Today, which called it a “wheel of confusion”. The West Bengal chief minister Jyoti Basu said, “The Cabinet change reflects the instability of the Congress (I) Government at the Centre”. Gandhi’s first action as Prime Minister was passing the anti-defection law in January 1985. According to this law, an elected Member of Parliament or legislative assembly could not join an opposition party until the next election. Historian Manish Telikicherla Chary calls it a measure of curbing corruption and bribery of ministers by switching parties so they could gain majority. Many such defections occurred during the 1980s as elected leaders of the Congress party joined opposition parties. In 1985, the Supreme Court of India ruled in favour of Muslim divorcee Shah Bano, declaring that her husband should give her alimony. Some Indian Muslims treated it as an encroachment upon Muslim Personal Law and protested against it. Gandhi agreed to their demands. In 1986, the Parliament of India passed The Muslim Women (Protection of Rights on Divorce) Act 1986, which nullified the Supreme Court’s judgment in the Shah Bano case. The Act diluted the Supreme Court judgment and allowed maintenance payments to divorced women only during the period of Iddah, or until 90 days after the divorce, according to the provisions of Islamic law. This was in contrast to Section 125 of the Code. Indian magazine Business and Economics called it a minority appeasement by Gandhi. Lawyer and former Law Minister of India, Ram Jethmalani, called the Act “retrogressive obscurantism for short-term minority populism”. Gandhi’s colleague Arif Mohammad Khan, who was then a Member of Parliament, resigned in protest. Prime Minister Rajiv Gandhi with Ram Kishore Shukla in 1988. In his election manifesto for the 1984 general election, he did not mention any economic reforms, but after assuming office he tried to liberalise the country’s economy. He did so by providing incentives to make private production profitable. Subsidies were given to corporate companies to increase industrial production, especially of durable goods. It was hoped this would increase economic growth and improve the quality of investment. But according to Professor Kohli of Cambridge University, Gandhi faced stiff opposition from Congress leadership who thought “it would open the economy to external economic influences”. Rural and tribal people protested because they saw them as “pro-rich” and “pro-city” reforms. Gandhi increased government support for science, technology and associated industries, and reduced import quotas, taxes and tariffs on technology-based industries, especially computers, airlines, defence and telecommunications. In 1986, he announced a National Policy on Education to modernise and expand higher education programs across India. In 1986, he founded the Jawahar Navodaya Vidyalaya System, which is a Central government-based education institution that provides rural populations with free residential education from grades six to twelve. His efforts created MTNL in 1986, and his public call officesbetter known as PCOshelped develop the telephone network in rural areas. He introduced measures to significantly reduce the Licence Raj after 1990, allowing businesses and individuals to purchase capital, consumer goods and import without bureaucratic restrictions. President Ronald Reagan, Sonia Gandhi, First Lady Nancy Reagan and Prime Minister Rajiv Gandhi, during a state dinner for Prime Minister Gandhi. June 1985. In 1986, by request of the President of Seychelles France-Albert René, Gandhi sent India’s navy to Seychelles to oppose an attempted coup against René. The intervention of India averted the coup. This mission was codenamed as Operation Flowers are Blooming. In 1987, India re-occupied the Quaid Post in the disputed Siachen region of the Indo-Pakistani border after winning what was termed Operation Rajiv. In the 1988 Maldives coup d’état, the Maldives president Maumoon Abdul Gayoom asked for help from Gandhi. He dispatched 1500 soldiers and the coup was suppressed. “Let us remove the mental partitions which obstruct the ennobling vision of the human family linked together in peace and prosperity. The Buddha’s message of compassion is the very condition of human survival in our age. The foiled bid of India recently to enter the Nuclear Suppliers Group, echoed his policy of non-proliferation to be linked to universal disarmament, which the World Nuclear Association refuses to recognise; non-proliferation being seen by India as essentially a weapon of the arms control regime, of the big nuclear powers as United States, Russia, United Kingdom, France, and China. In his five-day visit to the United States, in June 1985, he was provided with unbelievable security by the Ronald Reagan administration due to the separatist Sikhs, whose terrorist apparatus was now fully amalgamated with Islamic fundamentalist terror, both Libyan and Iranian. At this time peace was the only weapon of Rajiv Gandhi, having a family legacy of Gandhism, propagated by the Five Principles of Peaceful Coexistence, which he had been stressing since 1985, especially because of its inherent symbolic value to the Atomic bombings of Hiroshima and Nagasaki, and Paul Tibbets. In February 1987, the Pakistani President Zia-ul-Haq visited Delhi, where he met Gandhi to discuss “routine military exercises of the Indian army” on the borders of Rajasthan and Punjab. Two months later, Gandhi reciprocated by visiting Islamabad and meeting the new Prime Minister of Pakistan, Benazir Bhutto, to reaffirm the 1972 Shimla agreement. The Sri Lankan Civil War broke out with the Liberation Tigers of Tamil Eelam (LTTE), which was demanding an independent Tamil state in Sri Lanka. Gandhi discussed the matter with the Sri Lankan Prime Minister Ranasinghe Premadasa at the SAARC meeting in 1986. In that year, the Sri Lankan army blockaded the Tamil majority district of Jaffna; Gandhi ordered relief supplies to be dropped into the area by parachute because the Sri Lankan navy did not allow the Indian Navy to enter. The Government of India believe that, despite some problems and delays, many of which were foreseen but unavoidable in the resolution of an issue of this magnitude and complexity, this Agreement represents the only way of safeguarding legitimate Tamil interests and ensuring a durable peace in Sri Lanka. Some have chosen to criticise the Agreement. None has shown a better way of meeting the legitimate aspirations of the Tamils in Sri Lanka, restoring peace in that country and of meeting our own security concern in the region. We have accepted a role which is difficult, but which is in our national interests to discharge. We shall not shrink our obligations and commitments. This is a national endeavour. However, the LTTE refused to give up violence and used propaganda against India, threatening Tamils opposed to its cause. In 1987, Gandhi sent the Indian Peace Keeping Force (IPKF) to protect civilians and to apprehend anyone carrying arms. The IPKF was attacked by LTTE, which led to the former disarming the latter. Gandhi withdrew the IPKF in 1989. When I was inspecting the guard of honour and as I walked past one person, I saw through the corner of my eye some movement. I ducked down a little bit in a reflex action. By my ducking, he missed my head and the brunt of the blow came on my shoulder below the left ear. Rajiv Gandhi (left) congratulates Indian Army explorers for reaching the South Pole. Soon after assuming office, Gandhi released the leaders of the Akali Dal who had been imprisoned since 1984’s Operation Blue Star during Indira Gandhi’s prime ministership. He lifted the ban on All India Sikh Students Federation and filed an inquiry into the 1984 Anti-Sikh Riots. He also held a closed-door meeting with senior Akali Dal leaders to find a solution to the Punjab problem. Despite Akali opposition, in January 1985, Gandhi signed the Rajiv-Longowal Accord with Akali leader HS Longowal. Punjab’s state assembly election was scheduled in September 1985, but Longowal died and was replaced by Surjit Singh Barnala, who formed the government. After two years, in 1987, Barnala resigned his office because of a breakdown of law and order, leading to the implementation of President’s rule in the state. In May 1988, Gandhi launched the Operation Black Thunder to clear the Golden Temple in Amritsar of arms and gunmen. Two groups called National Security Guard and Special Action Group were created; they surrounded the temple in a 10-day siege during which the extremists’ weapons were confiscated. Congress leader Anand Sharma said, “Operation Black Thunder effectively demonstrated the will of Rajiv Gandhis government to take firm action to bring peace to Punjab”. Gandhi’s prime-ministership marked an increase of insurgency in northeast India. Mizo National Front demanded independence for Mizoram. In 1987, Gandhi addressed this problem; Mizoram and Arunachal Pradesh were given the status of states that were earlier union territories. Gandhi also ended the Assam Movement, which was launched by Assamese people to protest against the alleged illegal migration of Bangladeshi Muslims and immigration of other Bengalis to their state, which had reduced the Assamese to a minority there. He signed the Assam Accord on 15 August 1985. According to the accord, foreigners who came to the state between 1951 and 1961 were given full citizenship but those who arrived there between 1961 and 1971 did not get right to vote for the next ten years. Gandhi employed former Rockwell International executive Sam Pitroda as his adviser on public information infrastructure and innovation. During Gandhi’s time in office, public sector telecom companies MTNL and VSNL was developed. According to Pitroda, Gandhi’s ability to resist pressure from multi-national companies to abandon his plan to spread telecommunication services has been an important factor in India’s development. According to news website Oneindia, “About 20 years ago telephones were considered to be a thing for the use of the rich, but credit goes to Rajiv Gandhi for taking them to the rural masses”. Pitroda also said their plan to expand India’s telephone network succeeded because of Gandhi’s political support. According to Pitroda, by 2007 they were “adding six million phones every month”. Gandhi’s government also allowed the import of fully assembled motherboards, which led to the price of computers being reduced. According to some commentators, the seed for the information technology (IT) revolution was also planted during Rajiv Gandhis time. As Prime Minister he set up the National Informatics Centre and made it easier to import computers while setting up Technology Missions that today provide communication to each village across the country. Rajiv Gandhi’s finance minister, V. P. Singh, uncovered compromising details about government and political corruption, to the consternation of Congress leaders. Transferred to the Defence Ministry, Singh uncovered what became known as the Bofors scandal, which involved millions of US dollars and concerned alleged payoffs by the Swedish arms company Bofors through Italian businessman and Gandhi family associate Ottavio Quattrocchi, in return for Indian contracts. Upon discovering the scandal, Singh was dismissed from office and later resigned his Congress membership. Gandhi was later personally implicated in the scandal when the investigation was continued by Narasimhan Ram and Chitra Subramaniam of The Hindu newspaper, damaging his image as an honest politician. In 2004, he was posthumously cleared of this allegation. In his book, Unknown Facets of Rajiv Gandhi, Jyoti Basu and Indrajit Gupta, released in November 2013, former CBI director Dr. A P Mukherjee wrote that Gandhi wanted commission paid by defence suppliers to be used exclusively for meeting running expenses of the Congress party. Mukherjee said Gandhi explained his position in a meeting between the two at the Prime Minister’s residence on 19 June 1989. In May 2015, Indian president Pranab Mukherjee said the scandal was a “media trial” as “no Indian court has as yet established it as a scandal”. Opposition parties Lok Dal, Indian National Congress (Socialist) and Jan Morcha united under Singh to form the Janata Dal. Singh led the National Front coalition to victory in 1989 elections and he was sworn in as Prime Minister. Though the coalition won 143 seats compared to Congress’s 197, it gained majority in the lower house of the parliament through outside support from the Bharatiya Janta Party under the leadership of Atal Bihari Vajpayee and Lal Krishna Advani and the left parties such as the Communist Party of India (Marxist) and the Communist Party of India. Eminent lawyer and politician, former Law Minister of India Ram Jethmalani said that as Prime Minister, Gandhi was “lacklustre and mediocre”. In November 1991, Schweizer Illustrierte magazine published an article on black money held in secret accounts by Imelda Marcos and 14 other rulers of Third World countries. Citing McKinsey as a source, the article stated that Rajiv Gandhi held 2.5 billion Swiss francs in secret Indian accounts in Switzerland. Several leaders of opposition parties in India have raised the issue, citing the Schweizer Illustrierte article. In December 1991, Amal Datta raised the issue in the Indian Parliament; the Speaker of the Lok Sabha, Shivraj Patil, expunged Rajiv Gandhi’s name from the proceedings. In December 2011, Subramanian Swamy wrote to the director of the Central Bureau of Investigation, citing the article and asking him to take action on black money accounts of the Nehru-Gandhi family. On 29 December 2011, Ram Jethmalani made an indirect reference to the issue in the Rajya Sabha, calling it a shame that one of India’s former Prime Ministers was named by a Swiss magazine. This was met by uproar and a demand for withdrawal of the remark by the ruling Congress party members. In 1992, the Indian newspapers Times of India and The Hindu published reports alleging that Rajiv Gandhi had received funds from the KGB. The Russian government confirmed this disclosure and defended the payments as necessary for Soviet ideological interest. In their 1994 book The State Within a State, journalists Yevgenia Albats and Catherine Fitzpatrick quoted a letter signed by Viktor Chebrikov, head of the KGB, in the 1980s. The letter says the KGB maintained contact with Gandhi, who expressed his gratitude to the KGB for benefits accruing to his family from commercial dealings of a controlled firm. A considerable portion of funds obtained from this channel were used to support his party. Albats later said that in December 1985, Chebrikov had asked for authorisation from the Central Committee of the Communist Party of the Soviet Union to make payments to family members of Rajiv Gandhi, including Sonia Gandhi and Rahul Gandhi. The payments were authorised by a resolution and endorsed by the USSR Council of Ministers, and had been paid since 1971. In December 2001, Subramanian Swamy filed a writ petition in the Delhi High Court; the Court ordered CBI to ascertain the truth of the allegations in May 2002. After two years, the CBI told the Court Russia would not entertain such queries without a registered FIR. Rajiv Gandhi’s last public meeting was on 21 May 1991, at Sriperumbudur, a village approximately 40 km (25 mi) from Madras, where he was assassinated while campaigning for the Sriperumbudur Lok Sabha Congress candidate. At 10:10 pm, a woman later identified as Thenmozhi Rajaratnam, approached Gandhi in public and greeted him. She then bent down to touch his feet and detonated a belt laden with 700 g (1.5 lb) of RDX explosives tucked under her dress. The explosion killed Gandhi, Rajaratnam, and at least 25 other people. The assassination was captured by a 21-year-old local photographer, whose camera and film were found at the site. The cameraman, named Haribabu, died in the blast but the camera remained intact. Gandhi’s mutilated body was airlifted to the All India Institute of Medical Sciences in New Delhi for post-mortem, reconstruction and embalming. A state funeral was held for Gandhi on 24 May 1991; it was telecast live and was attended by dignitaries from over 60 countries. He was cremated at Veer Bhumi, on the banks of the river Yamuna near the shrines of his mother (Indira Gandhi), brother (Sanjay Gandhi), and grandfather Jawaharlal Nehru. The Supreme Court judgement, by Justice K. T. Thomas, confirmed that Gandhi was killed because of personal animosity by the LTTE chief Prabhakaran arising from his sending the Indian Peace Keeping Force (IPKF) to Sri Lanka and the alleged IPKF atrocities against Sri Lankan Tamils. The Gandhi administration had already antagonised other Tamil militant organisations like PLOTE for reversing the 1988 military coup in Maldives. The judgement further cites the death of Thileepan in a hunger strike and the suicide by 12 LTTE cadres in a vessel in Oct 1987. In the Jain Commission report, various people and agencies are named as suspects in the murder of Rajiv Gandhi. Among them, the cleric Chandraswami was suspected of involvement, including financing the assassination. Nalini Sriharan, the only surviving member of the five-member squad behind the assassination of Rajiv Gandhi, is serving life imprisonment. Arrested on 14 June 1991, she and 25 others were sentenced to death by a special court on 28 January 1998. The court confirmed the death sentences of four of the convicts, including Nalini, on 11 May 1999. Nalini was a close friend of an LTTE operative known as Sriharan alias Murugan, another convict in the case who has been sentenced to death. Nalini later gave birth to a girl, Harithra, in prison. Nalini’s death sentence was commuted to life imprisonment in April 2000. Rajiv’s widow, Sonia Gandhi, intervened and asked for clemency for Nalini on the grounds of the latter being a mother. Later, it was reported that Gandhi’s 19-year-old daughter, Priyanka Gandhi Vadra, had met Nalini at Vellore Central Prison in March 2008. Nalini regrets the killing of Gandhi and said the real conspirators have not been caught yet. In August 2011, the President of India rejected the clemency pleas of Murugan and two others on death rowSuthendraraja alias Santhan and Perarivalan alias Arivu. The execution of the three convicts was scheduled for 9 September 2011. However, the Madras High Court intervened and stayed their executions for eight weeks based on their petitions. In 2010, Nalini had petitioned the Madras High Court seeking release because she had served more than 20 years in prison. She argued that even life convicts were released after 14 years. The state government rejected her request. Murugan, Santhan and Perarivalan have said they are political prisoners rather than ordinary criminals. On 18 February 2014, the Supreme Court of India commuted the death sentences of Murugan, Santhan and Perarivalan to life imprisonment, holding that the 11-year-long delay in deciding their mercy petition had a dehumanising effect on them. On 19 February 2014 Tamil Nadu government decided to release all seven convicts in Rajiv Gandhi assassination case, including A G Perarivalan and Nalini. The Union of India challenged this decision before the Supreme Court, which referred the case to a Constitution Bench. The report of the Jain Commission created controversy when it accused the Tamil Nadu chief minister Karunanidhi of a role in the assassination, leading to Congress withdrawing its support for the I. K. Gujral government and fresh elections in 1998. LTTE spokesman Anton Balasingham told the Indian television channel NDTV the killing was a “great tragedy, a monumental historical tragedy which we deeply regret”. A memorial called Veer Bhumi was constructed at the place of Gandhi’s cremation in Delhi. In 1992, the Rajiv Gandhi National Sadbhavana Award was instituted by the Indian National Congress Party. A Right to Information (RTI) request filed in August 2009 found that more than 450 government projects and schemes are named after the Gandhi-Nehru family. In May 2012, Zee News reported there were 16 government schemes named after Gandhi, including Rajiv Awas Yojana and Rajiv Gandhi Udyami Mitra Yojana. In March 2015, Haryana sports minister Anil Vij said that at that time there were 232 rural stadia in India, with 226 of them being named after him. He said the government was “planning to rename” all the stadia in Haryana state named after him. Vij drew criticism from Congress leader Kuldeep Sharma, who said it was an “insult to their national leaders”. Rajiv Gandhi International Cricket Stadium at Hyderabad, Telangana. Rajiv Gandhi Stadium, Aizawl at Aizawl, Mizoram. Rajiv Gandhi International Airport at Hyderabad, Telangana. Rajiv Gandhi National University of Law, at Patiala, Punjab. Rajiv Gandhi University of Health Sciences, at Bangalore, Karnataka. Rajiv Gandhi Technical University, at Bhopal, Madhya Pradesh. Rajiv Gandhi Centre for Biotechnology, at Thiruvananthapuram, Kerala. Rajiv Gandhi Institute of Technology, at Kottayam, Kerala. Rajiv Gandhi Institute of Petroleum Technology, at Rae Bareli, Uttar Pradesh. Rajiv Gandhi Combined Cycle Power Project, at Alappuzha district, Kerala. Rajiv Gandhi University, at Doimukh, Arunachal Pradesh. Rajiv Gandhi National Institute of Intellectual Property Management. Rajiv Gandhi Government General Hospital, at Chennai, Tamil Nadu. Rajiv Gandhi Container Terminal, at Kochi, Kerala.